Lavender foal syndrome (LFS) is a lethal genetic disease affecting newborn foals. 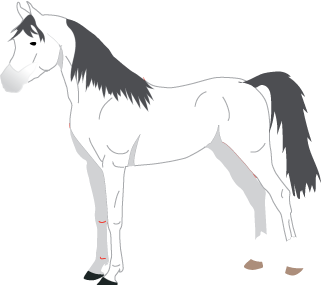 The condition gets its name from the odd hair coat coloring of the foals which is a silver, white, pale gray, pink or pale lavender hue. Upon birth, foals are unable to stand and are sometimes unable to lie upright. They often make paddling motions with legs and/or have seizures. It is important to conduct genetic screening of Arabian horses, to help reduce the carrier prevalence within the breeding population and reduce the birth of foals with lavender foal syndrome. There is no effective treatment. Foals are usually euthanized within a few days of birth.